Pete's Dragon feels like a rare breath of clean air in the cluttered, loud blockbuster universe, says Raja Sen. The first shot in Pete's Dragon is that of the back of a head, and it is an unmistakably Robert Redford waterfall of golden, cascading, Sundance-y curls. Redford, who turned 80 yesterday, is a strikingly jawed leading man who (still) looks like a poetic version of Captain America and who (now) holds worlds of wisdom in his piercing blue eyes. In this soft, sentimental film, Redford plays a man who once spotted a dragon and has never been able to get over it. He talks often of the stupefaction, calling it a feeling of magic. It is only fitting, then, that the closest this remakes comes to magic is when we are in the restrained yet invariably commanding presence of Redford himself. He's our dragon. A Disney remake of a 1977 Disney film of the same name, Pete's Dragon sets itself apart from any other recent three-dimensional summer release with its unhurried, old-school charm. At a time when filmmakers reared on Steven Spielberg are studiously making cover versions better than the original band's recent output, director David Lowery takes a slow, careful approach as he piles on obvious sentiment and, impressively, timelessness. This could indeed be a film we saw on VHS and are watching again a couple of decades later -- so strong is the familiarity and the lack of gimmickry. The plot is as threadbare as that of some of the most beloved children's books. One fine day, Pete (an adorable Oakes Fegley) is spotted by a plucky young girl, the sort who falls down a tree and hates having to admit she's hurt, and the mystery of the dragon unfolds in extremely familiar ways -- by way of Frankenstein and King Kong, to be exact. The dragon himself, Elliot, is a mellow green giant who, when riding on an open truck, grins like a shaggy dog sticking his head through the window of a moving car. He's a beast with the clumsiness of a child on the ground and aerodynamic perfection in the air, and the lack of a babysitting Khaleesi has served him well. He is also, most importantly, a vintage creature, looking like he's been rescued from a dreamy film of old and dried out for this outing. Even his wispy candyfloss fur, rendered with much realism, looks like it'd feel like straw, not shag, and the film effectively hints at the warmth below the bristles. Pete's Dragon is a mildly overlong film where the plot doesn't whizz past, and while it sounds simple to focus on the babble of the brooks and the rustling of the bushes, it feels like a rare breath of clean air in the cluttered, overloud blockbuster universe. The emotional manipulation is overt right from the start, and the film tries too hard to yank tears out of your eyes, and thus -- unlike Elliott -- it becomes increasingly graceless as the film goes on. Bryce Dallas Howard, as if atoning for her high-pitched role in the relentless Jurassic World, is here exaggeratedly maternal, while men -- who resemble starved and overfed versions of Jake Gyllenhaal and Brad Pitt respectively -- prove themselves of little use as the adventure unfolds. 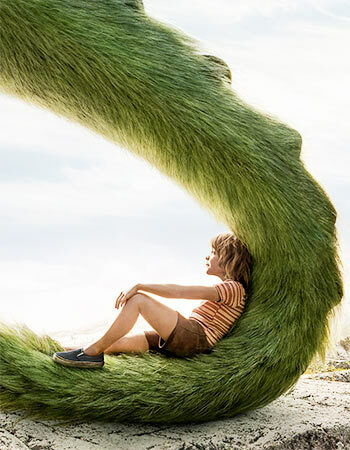 Still, despite the witless dialogue and the constant inevitability and convenience of the storytelling, there is much to be said for the restfulness offered up by Pete's Dragon. This is a giant-sized film which turns out to be a mercifully modest affair, and one must take advantage of cinema that surprises with pleasantry. This is what Lowery's film does, promising a star and delivering but a gleam. The back of that blond head doesn't even belong to Robert Redford.